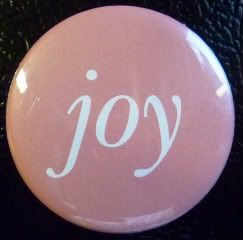 joy magnetism: Are you surprised? Nooooo, you can't tell me you're surprised that this magnet is the reason I bought that magnet set from the Virginia Museum of Fine Arts that I talked about yesterday. Sorry for the short & sweet - got hit with a cold this week and am fevery and sniffly today, the day I was supposed to go back to work after a week off. And, though it turns out that I probably got it from my STW BIL this past weekend, I'm really starting to believe in the physical manifestations of environmental (work) stress/distress. Thanks - back at work, with only slight sniffles and a sore throat. And, yep, they'll pretty much always be the Save the World couple for me, having met in the Peace Corps. Heh.